There were two targets today, one in Nebraska and another in North Dakota. 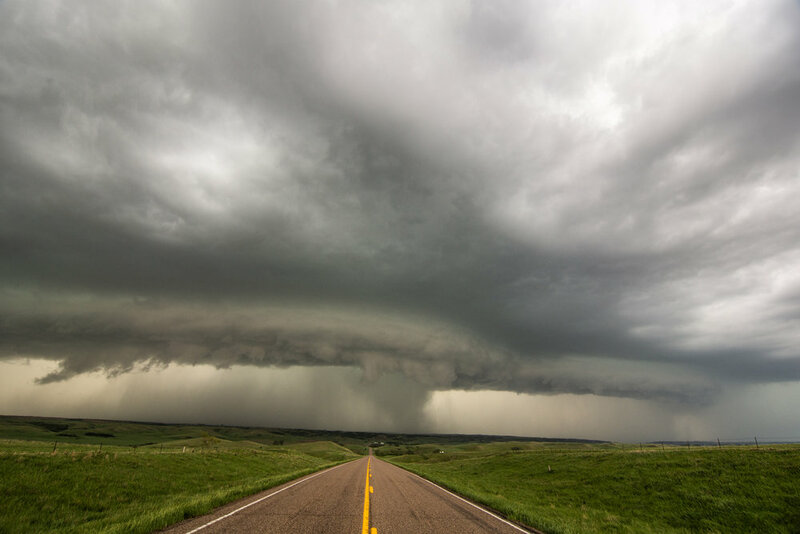 Decided on the northern target and took the long drive with Wes Hyduke out to western North Dakota to chase a triple point setup that offered decent tornado potential. Shear and instability were maximized right on the triple point and warm front, so we had an initial target in the vicinity of New Town to Makoti. Unfortunately, this was right on the north side of large reservoir Lake Sakakawea. The front ended up not lifting as fast as forecast, so we set up shop on I-94 near Glen Ullin, watching towers go up and down during the mid-afternoon hours. Storms finally went up right on the low and triple point along Hwy 85 to your northwest. 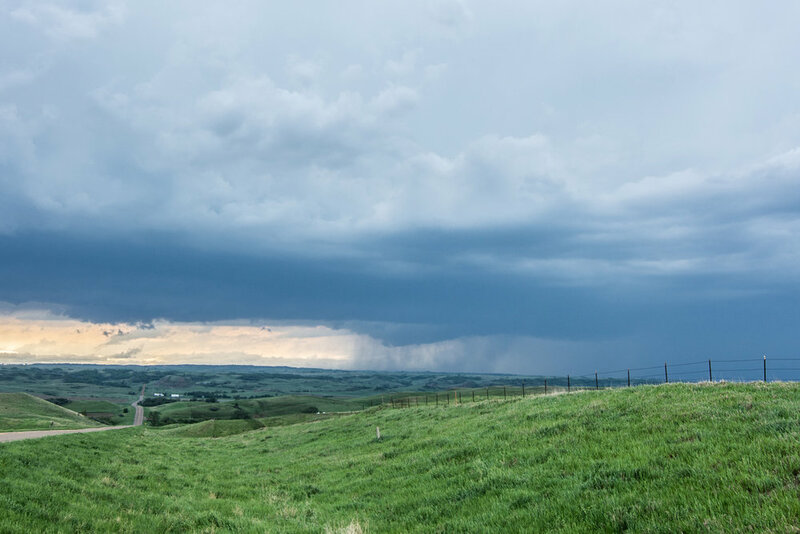 We headed up Hwy 8 towards Halliday as the storm became tornado warned, and ended up seeing a confirmed tornado from 19 miles away that was near the town of Medicine Hole. Since the storms were moving northeast, we could not get across the reservoir due to being cut off, so proceeded up towards Two Buttes on a hill with a great view off Hwy 22. 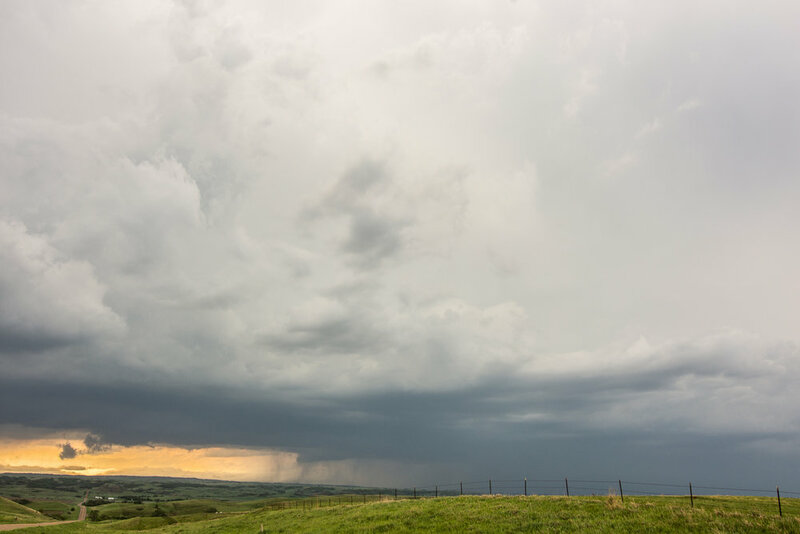 Here is where we saw 4 separate tornado warned storms, each with wall clouds moving south to north right in front of us. A few of these wall clouds had solid rotation and attempted to wrap up, but these eventually occluded before dropping a tornado. After about 1 good hour of chasing, the storms became a severe cluster of storms producing wind and hail. 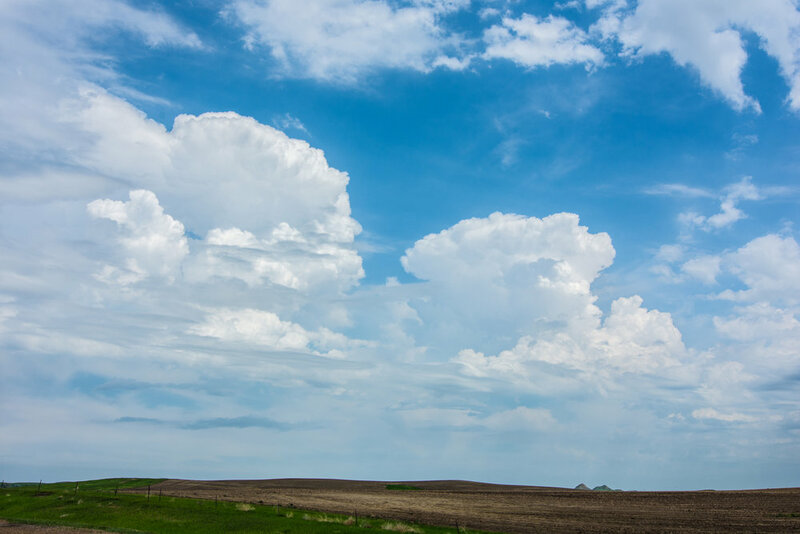 Looking to the southwest of Glen Ullin, North Dakota as updrafts were attempting to break the cap on the warm front as it was lifting north. This area later had a storm that produced a brief tornado, close to where we were at this point! 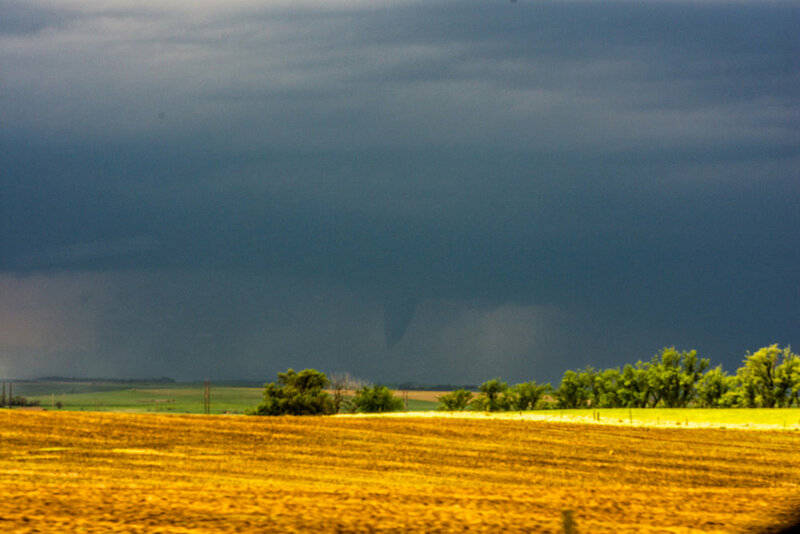 Tornado from 19 miles away that was near Medicine Hole, North Dakota. We were viewing from north of Halliday and trying to stair step northwest to get ahead of the storm at this point. Closer view of the tornado near Medicine Hole, taken from a distance. Set up shop east of Two Buttes on a large hill that had a great view to our west. We could see 3 supercells at once from this spot, all that were tornado warned at some point. Here is the 2nd supercell in the line coming up from the south with a visible wall cloud under the updraft. Visible rotating wall cloud on a tornado warned storm looking to our west-northwest. Wall cloud still present on the storm as it continued to slide off to the north. The 3rd storm in the line that came up from the south. Another lowering on this storm as well. A 4th supercell getting its act together and moving up from the south. I was just blown away by the view from this location. Storm becomes tornado warned as a wall cloud forms on the northeast side of the base. Wall cloud becomes better organized here, with upward condensating motion into it. Visible rotation at this time as well. Closer shot of the wall cloud from the previous photo. The closest that this storm came to producing a tornado. Could not tell if there was a big cone funnel or tornado tucked away back there, surrounded by heavy rain and hail. 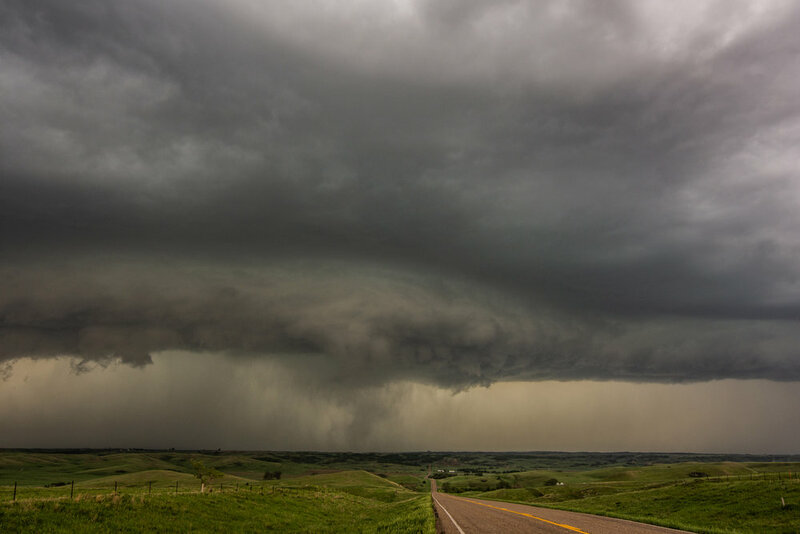 Twin mesocyclones northeast of Two Buttes, North Dakota. Great structure and foreground. 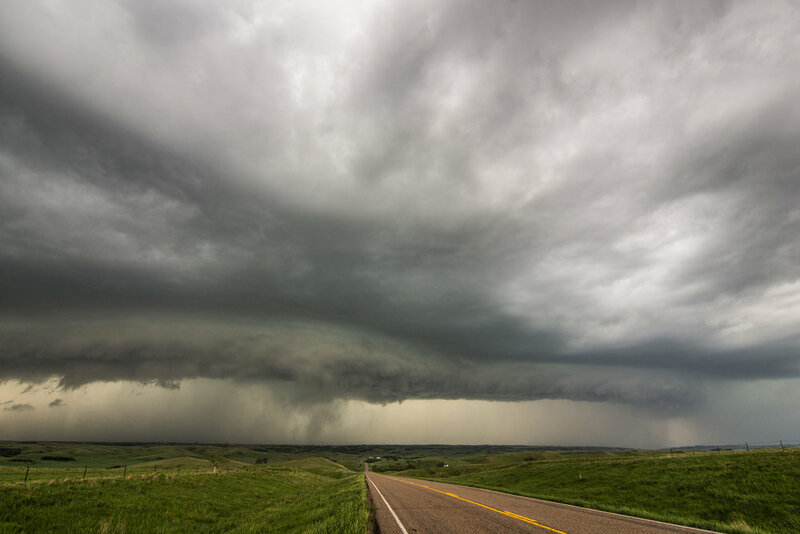 The 4th tornado warned storm of the day occurred as we headed east on Hwy 22 to keep ahead of the storms. 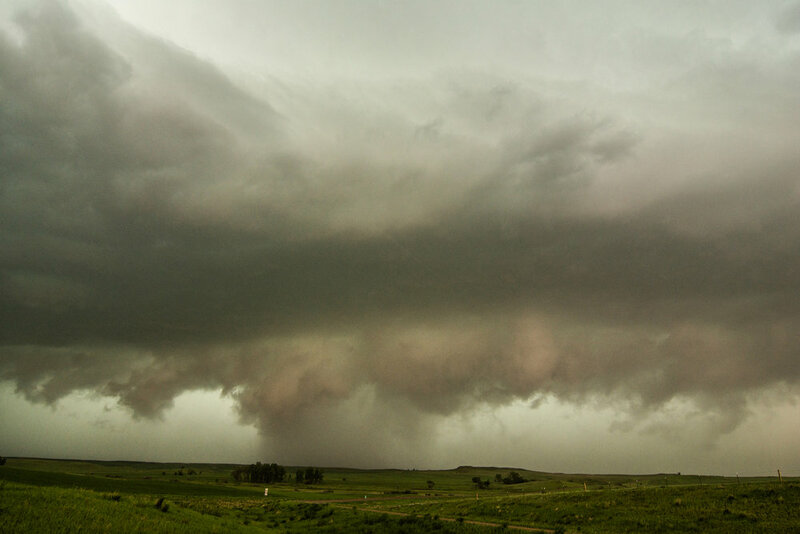 This was the last wall cloud we saw as the storms were really congealing into a severe cluster at this point. Closer shot of our last wall cloud of the day. This one was on the messy side but was still tornado warned with some slower rotation. Nice mammatus display covering the sky on the back side of the storms as we got back down to I-94 near Glen Ullin, North Dakota. Punched through the squall line through North Dakota and got ahead near Jamestown. It was completely dark at this point, but I caught a decent view of the storm with an 8 second shutter speed. 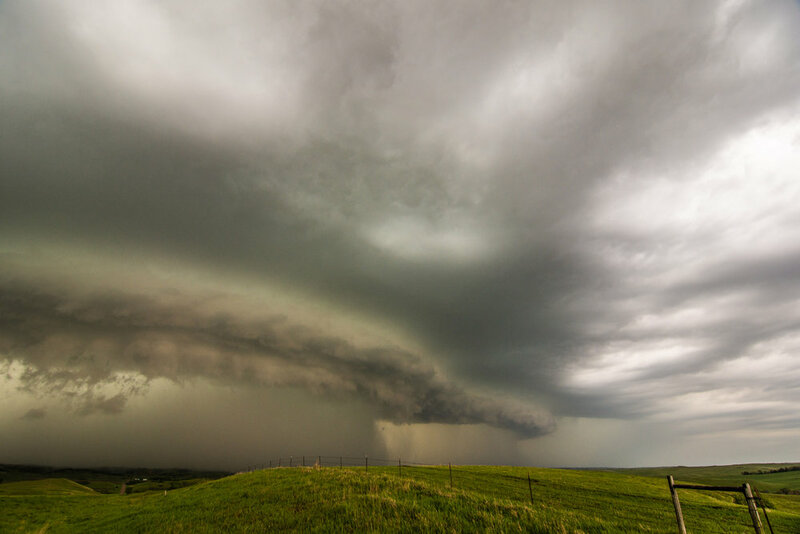 Looking to the south at the shelf cloud overtaking Jamestown, North Dakota. The chase vehicle G6 is on the left with Wes in the passenger seat. Mesoscale discussion issued at 2:13 PM CDT highlighting the severe weather potential with all hazards possible. 3,000 j/kg of MUCAPE nosing up into the area with 50 kts of effective bulk shear. Tornado watch issued at 3:20 PM CDT! Another mesoscale discussion issued at 6:02 PM CDT, highlighting the greatest short term risk for tornadoes. 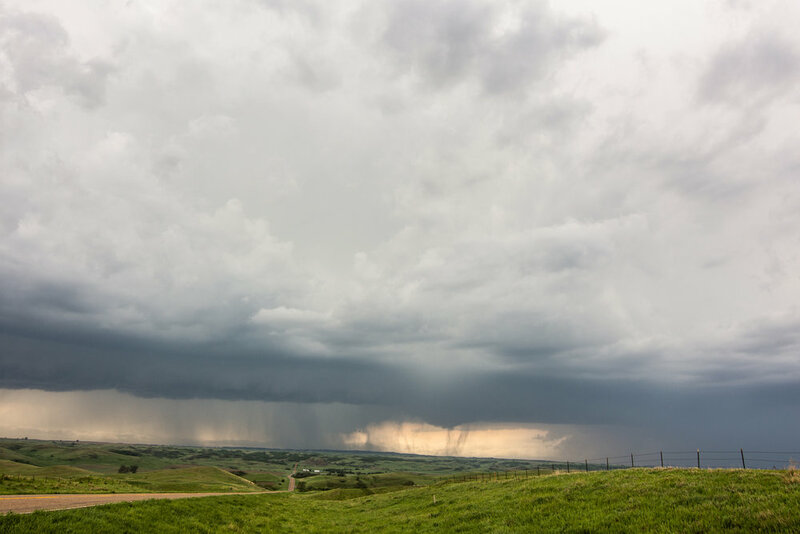 The tornado threat was quickly diminishing at this point as storms congealed, even in the presence of strong deep layer shear and moderate instability. Yet another mesoscale discussion issued at 8:30 PM CDT highlighting the area of greatest severe weather risk. This was as we were core punching through the storm to get ahead near Jamestown.